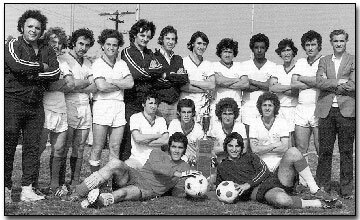 The semi-pro Maccabee Soccer Team of the 1971-1981 era won the national United States Open Challenge Cup five times in eleven years. In 1976-77, Maccabee’s record was 35-0, enroute to sweeping the Los Angeles title, the California State Open, and the U.S. Open Cup. The soccer team--the original activity of today’s Maccabee Athletic Club--was organized by a group of mostly European Jewish immigrants who were players/supporters of the pre and post-World War II U.S. soccer scene. They dominated the sport in Southern California in the 1970s-early 80s, and more or less, the United States, itself. In addition to winning the U.S. Open Challenge Cup in 1973, 1975, 1977, 1978 and 1981--and were runners-up twice--the Maccabees captured Greater Los Angeles Championships in 1971-72, 1973-74, 1974-75, 1977-78 and 1978-79; and California Open Cups in 1976, 1978, 1979. At the peak of its on-field success, the Maccabee Athletic Club began a serious commitment to youth soccer and other youth sports activities. Until the 1980s, top flight soccer in the U.S. consisted mostly of ethnic-themed teams, with mostly European and South American-born personnel and supporters. Top teams, for example, included the: Cleveland Italia, Chicago Croatians, San Francisco Sons of Italy, et als. L.A.’s top team pre-Maccabees was the Magyars (Hungarians).